Wood is an abundant, renewable resource—we should use it more. The Baltimore Wood Project brings new partners and ideas together to be smarter and more thoughtful about urban wood “waste” in the city. More than creating a boutique urban wood niche, this project is about building a networked regional economy around wood and land restoration that is rooted in reclaiming wood, reclaiming lives, and reclaiming neighborhoods in urban and rural areas. What we are building in Baltimore is the pilot—we intend for this model to be replicated in any community struggling with similar challenges. Wood is salvaged from building deconstruction and urban tree care operations, and taken out of the city’s waste stream. Collected wood is diverted from space-limited landfills and other waste facilities. A local facility is dedicated to sorting and processing salvaged wood for its best use. The wood is repurposed and resold locally, creating a closed loop system. Reclaimed and upcycled wood products are available for sustainable building, furniture, energy, and other uses. 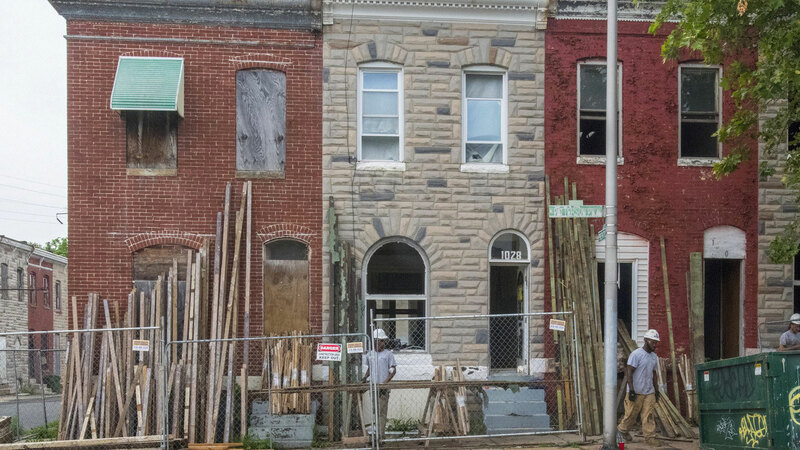 4,000 Baltimore rowhouses are slated for demolition over the next four years. Assessing the city’s urban wood actual and potential resources: Using Urban Forest Inventory and Analysis (Urban FIA) and other inventory data, we’re taking stock of Baltimore’s wood inventory and what is normally considered wood “waste”—both salvageable wood from vacant buildings, and woody materials from tree removals, pruning, utility maintenance, land clearing. The Forest Service has helped define the parameters around developing an urban wood inventory, as there is often no other single entity with the breadth of vision that is willing or able to initiate city-wide inventories of urban wood that can lead to the development of networked, regional wood economies. Urban FIA: The USDA Forest Service’s Forest Inventory and Analysis (FIA) program has provided a census of the nation’s forests since it was first established in 1930. In the 2014 Farm Bill, FIA was expanded to include not only forested land but all trees; for the first time, FIA began to collect information on trees and forests in urban areas. Implementation of Urban FIA is being phased in, with cities being added in over time. Baltimore was one of the first cities to implement the program, beginning in 2014. Baltimore is on a 7-year panel, meaning data are collected on 1/7 of the plots each year. After 7 years, we will have completed data collection on all Urban FIA plots in Baltimore. The 8th year will repeat year one and data will be collected on an ongoing basis. Over time, this will allow us to estimate how many trees there are in Baltimore, where they grow, what condition they are in, and how population, species, and condition are changing over time. In addition, data will be collected on landowner beliefs and attitudes about urban trees, as well as on urban wood flows; this information can be used in a variety of ways to support and grow diversified regional wood economies. Baltimore City Tree Inventory: Baltimore City is undertaking its first comprehensive street tree inventory in over half a century. This inventory will help City crews identify and manage public tree resources. Utilizing urban wood means diverting it from the waste stream: Urban wood waste is a by-product of certain activities such as tree care operations, land development, and building deconstruction. Unlike traditional forestry, in which trees are managed as a crop for harvest, urban wood waste utilization diverts wood from the waste stream and begins the process for wood waste to be converted into wealth. There are estimated to be over 18,000 abandoned structures in the City of Baltimore. With 75% of the wood in these structures available for recovery, deconstruction makes more sense than demolition. The “waste” generated in both of these streams is significant in volume and, despite variations in quality, represents a range of opportunities for processing and production into materials that can support jobs and markets. 1 McKeever, David B.; Skog, Kenneth E. 2003. Urban tree and woody yard residues - Another wood resource. Res. Note FPL-RN-0290. Madison, WI: U.S. Department of Agriculture, Forest Service, Forest Products Laboratory. 4 p.
2 Bratkovich, Steve, J.Bowyer, A. Lindberg, K Fernholz. 2009. Reclaiming Lumber Products from Waste Wood. Dovetail Partners, Inc. Transforming the traditional waste model: We’re designing ways to recover good wood from buildings before they come down, and collect “fresh cut” wood from tree removals, pruning, and land clearing—saving it all from becoming waste. Humanim is a social enterprise and workforce development NGO whose mission is to support and empower individuals who face social or economic challenges. With many of Baltimore’s communities facing high unemployment rates and many vacant buildings, Humanim launched DETAILS Deconstruction. For every job created by typical demolition, deconstruction creates 6-8. 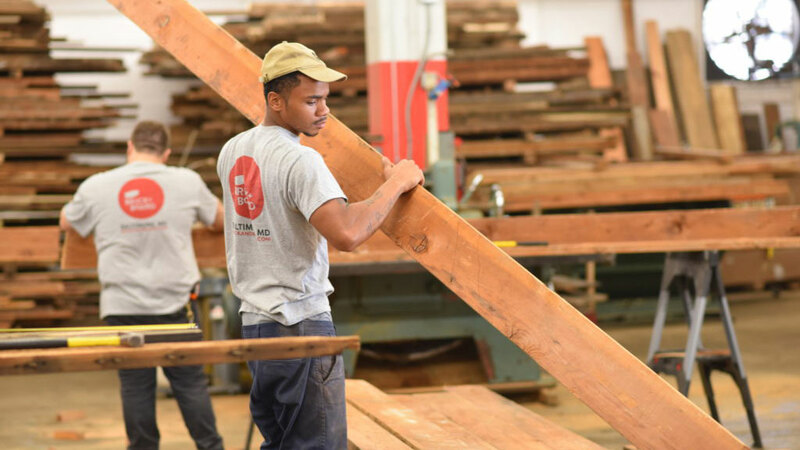 By salvaging flooring, framing, and architectural elements from buildings being decommissioned, every DETAILS project diverts material from the waste stream and creates jobs for people with barriers to employment. Since 2012, DETAILS has trained and employed over 165 low income residents from Baltimore that faced barriers to employment, with zero percent recidivism [N1] for staff members. Over $4.1 million in revenue has been generated from sales of recovered material over that time period. DETAILS has increased salvageable yields to approximately 7,500 bricks, 400 square feet of flooring, and 1,400 board feet of lumber for each deconstructed row house. Sorting is a new practice for many cities. The way that wood waste materials—particularly fresh cut wood waste—are generated and salvaged often does not allow for the wood materials to be sorted at the work-site. Often, there is a large amount of low-quality material and a small amount of high-quality material. Sorting is the key to capturing and maximizing value. In years past, Baltimore City’s in-house and contract tree care crews would generate waste from tree care operations and bring it Camp Small. Material would aggregate until the pile became unmanageable and the City would be forced to pay for its removal. In 2016, the Department of Recreation and Parks, in collaboration with the Baltimore Office of Sustainability, began the Camp Small Zero Waste initiative. The initiative received start-up funding based on its promise that continued success would stem from the ability to be entrepreneurial and generate revenues. They hired a yardmaster to oversee operations at the site. In order to maximize the bottom line, the yardmaster focused on optimizing the value of the materials before they even arrived at Camp Small, collaborating with the Maryland Department of Natural Resources and the Forest Service to put together a half-day seminar to teach the crews how to identify and harvest potential high-value urban wood. Equipment additions and infrastructure upgrades followed. Camp Small now sells compost, chips, and logs (prime, seconds, and thirds) turning a prior liability into an asset. Processing adds value but takes time: Once material is sorted, it can be processed. Primary processing is the first step in taking raw plant material and preparing it for use as is, or for secondary processing into finished products. Fresh cut requires primary processing; deconstructed material often requires additional processing to restore or alter the finish before it can be remade into finished products. Wood must be cut and dried before it is manufactured into things art and furniture. If it is not, as it dries it may split, crack, or warp. Air drying a piece of wood can take one to two years. This creates a long time for small operators to wait for material to be ready, and requires them to hold a lot of inventory of wood to be processed. Additionally, conventional kilns can be quite expensive to purchase and operate. The Forest Products Lab, a USDA Forest Service Research & Development facility, is testing alternative kiln designs that can be purchased and operated at much lower cost. In a current research partnership with Treincarnation, initial results show that such kilns can cut drying time up to four times in comparison with air drying. 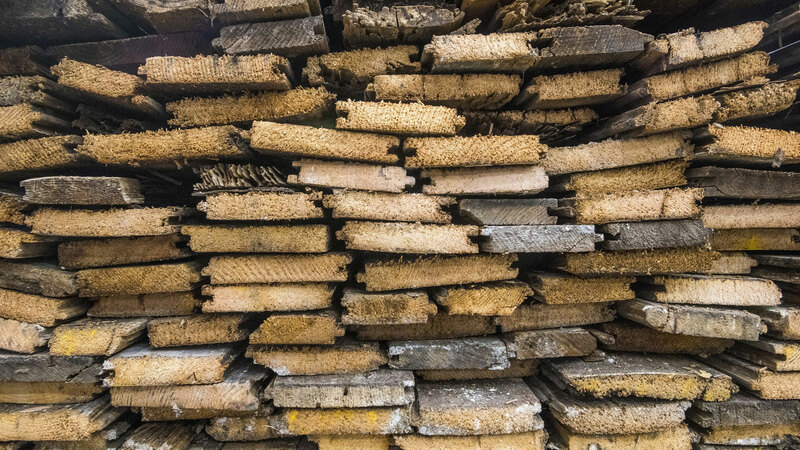 This technology shows promise for greatly reducing processing time for urban wood processors. Production creates sales: Production, or secondary processing, is taking the woody material after it has been sawn, dried, shredded, split, ground, etc. and making it into a product for sale or consumption. Building a reliable and robust supply chain and attracting national investors and buyers is a key to scaling from a boutique operation to an urban wood economy, and the U.S. Forest Service, Humanim, and the City of Baltimore are partnering particularly effectively to do this. As DETAILS Deconstruction looked for new opportunities for jobs and materials, they hit upon an idea: a brick and mortar facility that could serve as a warehouse, a retail outlet, and workshop to perform some value-added processing. Thus, Brick + Board was born. On N Howard St in Baltimore, the former auto center is on a parcel that is just under an acre and has 28,324 square feet of space. Brick + Board cannot mill raw logs, but can perform almost any other milling, sanding, or brushing needed on deconstructed or fresh cut wood. The new capacity provides further opportunities for job creation in line with Humanim’s mission, and also adds value for potential new wholesale and retail markets. 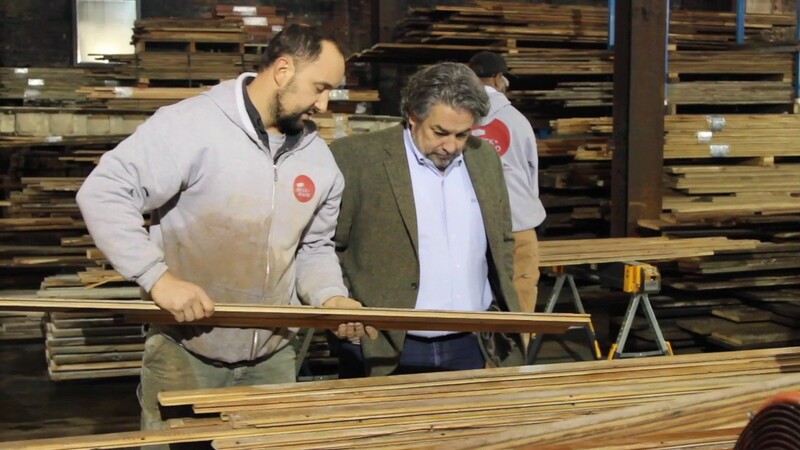 The USDA Forest Service, Humanim, and the City of Baltimore are working with social-impact investment firm Quantified Ventures to diversify resources, scale impact, and replicate the urban wood economy to create jobs, promote sustainability, and support the national wood industry in other post-industrial cities. This has resulted in the state of Maryland’s commitment to scale up the work in Baltimore to create greater economic, social, environmental, and health benefits, and improve quality of life for residents. Consumption drives the urban wood economy: Once produced, the goods go to market and are sold and used. How this process occurs will depend on the supply chain. Consume is a very important aspect of the urban wood flows model—if no one buys it at a profitable, self-sustaining scale, it’s a hobby rather than a business. In 2017, the USDA Forest Service formalized a partnership with Room & Board, a national retailer that creates handcrafted, American-made, modern furniture and shares a vision of supporting the national wood industry and local jobs and livelihoods in rural and urban areas. Room & Board has launched a special line of furniture products using Baltimore-sourced wood, with much of the manufacturing connected to and carried out by small producers in West Virginia, Pennsylvania, and Vermont, though some pieces are also being made at Baltimore’s Open Works. These products showcase the value of urban wood and the many social, economic, and environmental benefits of a vibrant U.S. wood industry. The partnership was recently featured on the front page of USA Today and on NBC Nightly News. What comes next on urban lands? : This is the final part of the life cycle, that takes place after and in addition to rethinking wood waste. It involves the question of “what comes next” on deconstructed and vacant lots, as well as on land where fresh cut trees have come down. Restoring land by planting new trees and creating green space has myriad benefits to public health, safety, crime, as well as to a community’s economy and to watershed health. USDA Forest Service Research & Development is engaged in social-ecological research that examines how green investments in neighborhoods and communities can transform economies, safety, and human and ecological health. Our research continues to demonstrate how thriving urban forests boost public health, safety, sustainability, and economic growth. Find more research or make the case at Vibrant Cities Lab. The USDA Forest Service, together with Humanim and the City of Baltimore, will host a pilot Urban Wood Academy December 11–13, 2018, in Baltimore, MD. The Urban Wood Academy is a multi-day experiential workshop designed to share best practices and lessons learned around shared stewardship and building a networked, regional wood economy. The Academy will allow practitioners to learn directly from Forest Service staff and partners who have developed and are scaling a successful urban wood economy in Baltimore. In addition, it will facilitate two way dialogue, uncovering potential differences in how a networked, regional wood economy may be implemented in different communities. For more information, please contact Sarah Hines. 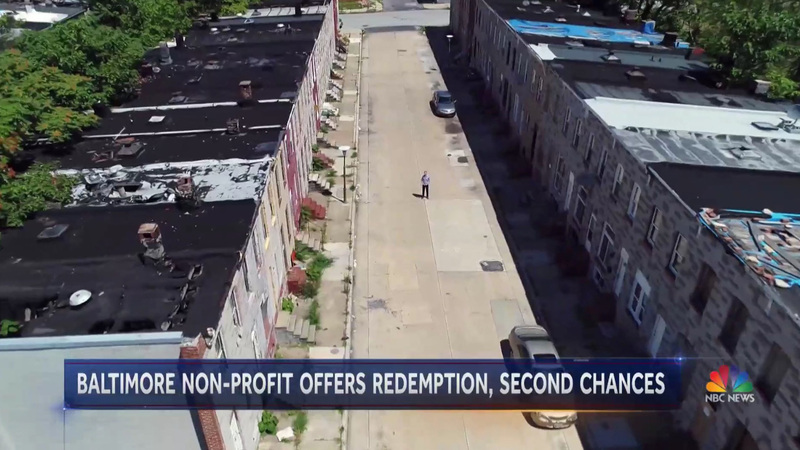 NBC Nightly News New Baltimore program aims to help communities by salvaging wood from vacant homes. USA Today Baltimore is mired in violent crime. Could part of the solution be found in reclaimed wood? Beyond providing one-off programs, resources, or technical assistance, the USDA Forest Service and partners have woven together the Urban Wood & Restoration Economy Business Model that attracts private sector businesses and creates a self-reinforcing economy that enables land and ecosystem restoration, promotes economic development (including jobs, businesses, and markets), and improves lives in urban areas. We are working to prototype the Urban Wood Economy Business Model beyond the pilot city of Baltimore. ©2018 Baltimore Wood Project. All Rights Reserved. Photography by Andy Cook & USDA Forest Service. Website By Hardly Square.